The date is 12-12-12 and that will not happen again for a hundred years! To celebrate, we decided to offer a handful of items from our catalog for just $12 each. While you might not be able to place these presents under the Christmas tree, you will be able to use them with your family the whole year through and have something fresh for school when the New Year begins. These $12 Specials will ONLY be available today, December 12, 2012 and will end at 12:00 midnight Pacific Standard Time! TimeTrek Ancient Map Bundle includes 11 dynamic, animated maps of Ancient China, 12 for the Rise of Rome and 9 for the Fall of Rome. Each TimeTrek set includes dynamic, animated maps, quizzes and encyclopedic information for each, as well as complete Teacher Notes with activities, map commentaries, timeline pages and student maps to label and color. Mac and Windows versions available. Regular price is $24.00. Sale price $12. "Our experience with TimeMaps was exactly the same as every other experience we've had with Knowledge Quest products... Totally awesome! This company is always giving us their best. The program does everything it claims and the teachers notes are wonderful!" TimeTrek Medieval Map Bundle includes 9 dynamic, animated maps of the Rise of Islam, 9 of the Black Death and 9 for European Explorers. Each TimeTrek set includes dynamic, animated maps, quizzes and encyclopedic information for each, as well as complete Teacher Notes with activities, map commentaries, timeline pages and student maps to label and color. Mac and Windows versions available. Regular price is $24.00. Sale price $12. "We really liked TimeTrek. They make history come alive. Seeing the spread of the black death or the progression of the Atlantic slave trade in a year by year format really helped us to understand what happened in a step-by-step progression. I must say, I had many ‘a-ha!’ moments just working through these TimeTrek." “A Child's Geography: Exploring His Earth” is about getting to know what's under our feet, over our heads and in the world around us—the atmosphere, the hydrosphere, the lithosphere—and then how to get around this world—maps, latitude and longitude. Do you know how many gallons of water float in a cloud over our head—how far it is to the center of the Earth—what causes magnificent auroras, God's love lights—how God used the Flood to puzzle our planet into different shifting plates? Well, hop on board to experience Adventures for the Inquisitive Child—and every excursion glorifies our breathtaking Creator! 243 pages. All files are in PDF format. Mac and Windows compatible. Regular ebook price is $24.95. Sale Price - $12. Iraq, Jordan, Israel, Saudi Arabia, Egypt, and Turkey...your family probably hears or reads about these names frequently. In an increasingly complex world, it is vitally important that children learn to see the world through their Creator's eyes. As we explore the Holy Land you and your family will delight in incredible, mysterious landscapes, hidden wonders and beautiful peoples - all created in God's image. We will travel through the lands of Scripture, discovering familiar Biblical landmarks, such as the possible resting place of Noah's Ark, the remains of the Tower of Babel, the tracks of Moses up to the peak of Mount Sinai, and so much more... 276 pages. All files are in PDF format. Mac and Windows compatible. Regular price is $24.95. Sale Price - $12. 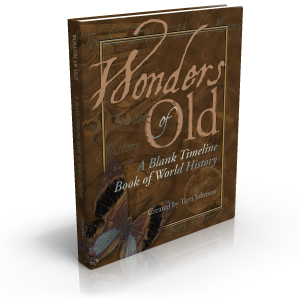 Wonders of Old - a Blank Timeline Book is divided into four historical time periods: ancient, medieval, new world and modern. Significant dates are listed at the conclusion of each section as a helpful reference. Timeline category stickers are included. All files are in PDF format. Mac and Windows compatible. Regular ebook price is $19.95. Sale Price - $12. Hi, my name is Terri Johnson. My husband, Todd, and I have been running our publishing business from home since 2001. In 2005, Knowledge Quest, Inc. became our primary source of income and Todd was able to quit his full-time job and work from home. You may or may not know that I am a busy homeschooling mom with six children (pre-school up to teens), so I spend a good portion of my days teaching my children (and driving them all over town!). My husband's story is the same - our six children keep us pretty busy. But I wanted to take 4 weeks out of my regular schedule to do something different - and that is to teach other busy homeschool moms (and dads) how to succeed at starting and growing an online business from home. So that's what I did! Listen in to the 4 part class recordings at your convenience. Regular price is $97.00. This is a smashing deal for $12 today only.